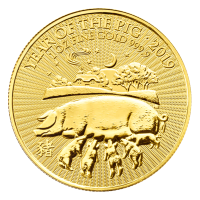 1 oz 2019 British Royal Mint Lunar Year of the Pig Gold Coin | ?? 正面 Jody Clark effigy of Queen Elizabeth II with a new Guilloche style backround and the words "Elizabeth II D.G. Reg F.D 100 Pounds"
反面 A mother pig feeding her young, followed by the year, weight, purity and ' Year of the pig' title.